The currency conversion (euros/dollars) is on the left and the temperature conversion is on the right. The code for the card is written in PostScript and can be easily updated for the current exchange rate. Paste it into a plain text file and give it a “ps” extension. % Conversion from inches to points (after the Blue Book). % In the left half of the card we'll do a scale with dollars and euros. % half of an index card, a quarter-inch up from the bottom. % In the right half of the card we'll do a scale with temperatures. 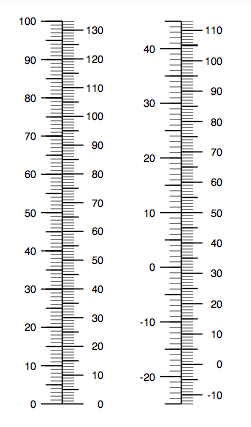 % Conversions from degrees C and degrees F to points. % 70 degC will cover 4.5 inches. % right half of an index card, a quarter-inch up from the bottom. After the boilerplate comments, a few utility functions are defined: one for converting inches to points, one for printing right-justified text, one for printing out series of hashmarks, and a few for manipulating the PostScript stack. (PostScript, like Forth, is a stack-based, postfix language.) The “blue book” mentioned in the comments is Adobe’s PostScript tutorial, which you can download from here. Let’s talk about printing the card. First, you’ll notice some comments about starting so many inches in from the left edge and so many inches up from the bottom. The commands associated with these comments put the scales in an index-card-sized area at the top center of a piece of US letter paper. US letter is the default paper size for my printer, and when I stick an index card into the manual feed tray, these margins put the scales right where I want them. 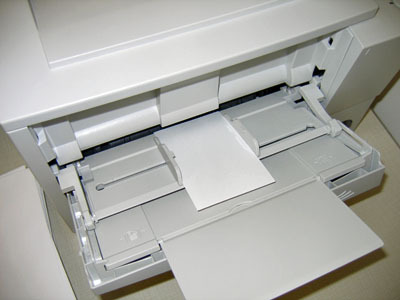 If the sliding guides in your printer’s manual feed tray set the index card at the left or right edge instead of in the center, you’ll have to change the margins. The comments should be a pretty good guide (ho-ho) to changing the margin command. will create a filename.pdf file in the same directory in a couple of seconds. Linux users that want to convert the file to PDF will almost certainly have Ghostscript and ps2pdf on their machines. I have no idea what will work best for Windows users and have no desire to figure it out. Happy traveling! Send me an e-postcard if you use this. Update I’ve rewritten this to generate a PDF directly. The new version is also easier to customize for other currencies and written in a more common language, Ruby. You can see the new version here.